[ Mark Thurston, Accountant General of the Court of Chancery. ] Autograph Signature ('M Thurston | Acct Genl') on Exchequer receipt, on behalf of 'ye Assignee of Fra: Raquet'. [ Receipt of His Majesty's Exchequer, London. ] 9 August 1734. 1p., 8vo. 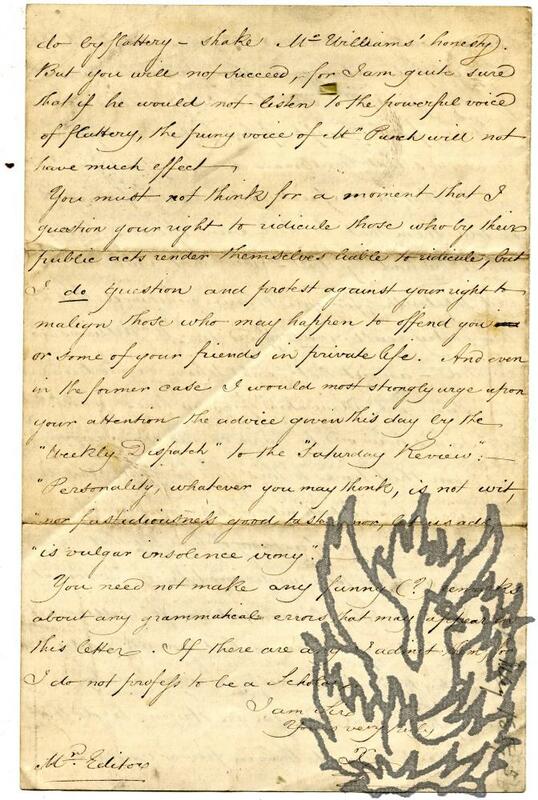 On aged and worn paper, with chipping to extremities (and around signature). Laid out in the customary fashion, with printed text completed in manuscript. Thurston is described as 'Accomptt General to ye Court of Chancery Appointed to <?> for ye Assignee of Fra: Raquet', receiving £10 from an annuity. Signed at foot by the witness, 'E Clarke'. [ Mark Hambourg, classical pianist. ] Autograph Card Signed to 'Cyril' [ English actor Cyril Maude ], regarding arrangements for his performance at Maude's 'grand benefit'. Card with letterhead 5 Langford Close, Langford Place, NW8 [ London ]. 24 February [ 1942 ]. In good condition, lightly aged, with one vertical crease. Stamped and postmarked, and addressed to 'Cyril Maude Esqre. | Redlap | Dartmouth. | Devon'. For more about Hambourg, see his entry in the Oxford DNB. He writes: 'My dear Cyril | I'm afraid the Chappell Piano is necessary for me, as however good a theatre piano, it would not be good enough for a performance at your "Grand Benefit." | Yours with best wishes | Mark Hambourg'. Maude's 'Birthday Benefit Matinée' took place for charity at the Haymarket Theatre, 24 April 1942. 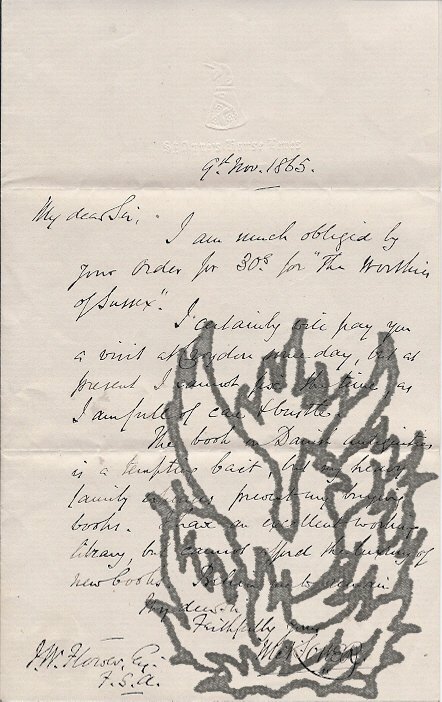 [Cyril Clemens] Autograph Letter Signed to Robert Lynd, author. Cyril Clemens (1902-1999), President, International Mark Twain Society, Missouri. ALS, on his presidential letterhead; 14 July 1932, 2pp., 8vo, good condition, with enclosure. His 'Little Visits to the Great' is 'almost ready to go to press, but we are holding things up for the Chapter on "Robert and Sylvia Lynd." If you and Mrs Lynd could glance it over and scratch out any thing that I remembered inaccurately, [...]'. 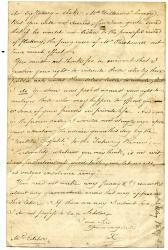 With a mimeographed typewritten copy (1 p, fol. 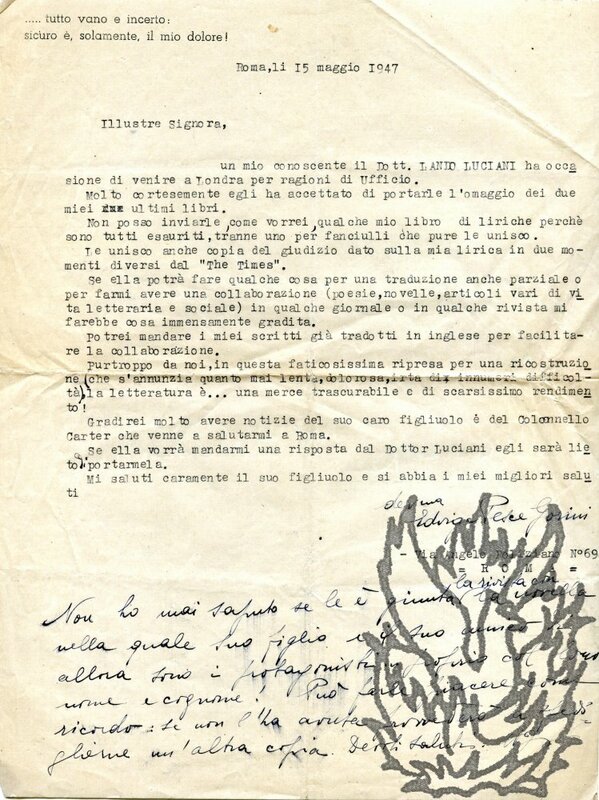 ), transcribing three 1937 letters to Clemens, two from Douglas Hyde and the last from W. B. Yeats. [William Samuel Woodin, Victorian entertainer.] Autograph Letter Signed ('W. S Woodin') to W. C. M. Kent [Dickens's friend Charles Kent], editor of the Sun, regarding his refurbishment of the Myriographic Hall, Piccadilly, for entertainments. Myriographic Hall, 232 Piccadilly [London]. 1 March 1853. 3pp., 12mo. Bifolium. In good condition, on aged paper. With envelope addressed by Woodin to 'W. C. M. Kent Esqr | Sun Office', on which is written 'Your Card of course will admit any Friends'. The letter begins: 'My very dear Sir, | I have taken the Salle Robin and called it The Myriographic Hall, now I intend inviting the gentlemen of the Press on Thursday Evening March 3rd. On letterhead of Eastburn House, Park Road, Dewsbury. 11 July 1948. 4pp., 4to. 75 lines of neatly-written text. On creased aged paper, with a few closed tears (one of them 11cm long). He begins by praising Bonham-Carters 'objective & informed comments on American opinion' ('I hope you will feel encouraged to publish more of your findings'). 'But gratitude & a thirst for information & about American politics are not my only reason [sic] for writing. I wish you were in England, for I would very much enjoy an exchange of views with you about the position of the Party. Lewes [Sussex]. 23 May 1851. 1p., 12mo. Good, on lightly-aged paper. Written in a bold, attractive hand. The letter begins: 'It was with much regret that I was compelled to forgo the honour of attending your Lordship's Conversazione on Wednesday.' He was called to Hastings that day by '[u]navoidable business', but hopes to have 'during the continuance of the Exhibition, an opportunity of waiting on your Lordship'. Signed bromide print of photograph by Mark Gerson of the actress Jill Balcon with bust of Cecil Day-Lewis. 'London. Mark Gerson. AIBP/ARPS'. Circa 1961. Black and white matt bromide print photograph in card frame with covering flap. Dimensions of photograph 20 x 25 cm. Dimensions of frame 25.5 x 32 cm. 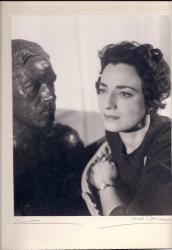 A head and shoulders shot of Balcon, staring across the photograph from the right, left hand at right shoulder, with the bust of Day-Lewis facing her from the left. Inscription in pencil on frame beneath photograph: 'London. Mark Gerson. AIBP/ARPS'. Photograph and inscription in excellent condition; frame aged and worn. 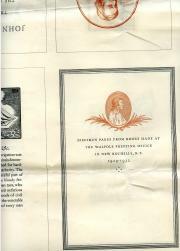 A folio leaf containing seven 'Specimen Pages from Books made at the Walpole Printing Office in New Rochelle, N.Y, including the title-page and frontispiece of the limited edition of T. S. Eliot's 'John Dryden'. 1929-1932. The Walpole Printing Office in New Rochelle, N.Y. Printed in black and sepia on both sides of a leaf of watermarked wove paper, 45 x 30 cm. On lightly-aged paper with one vertical and two horizontal fold lines. The seven sample pages feature a total of six illustrations, in a variety of styles, two by Herb Roth. The arrangement is as follows. 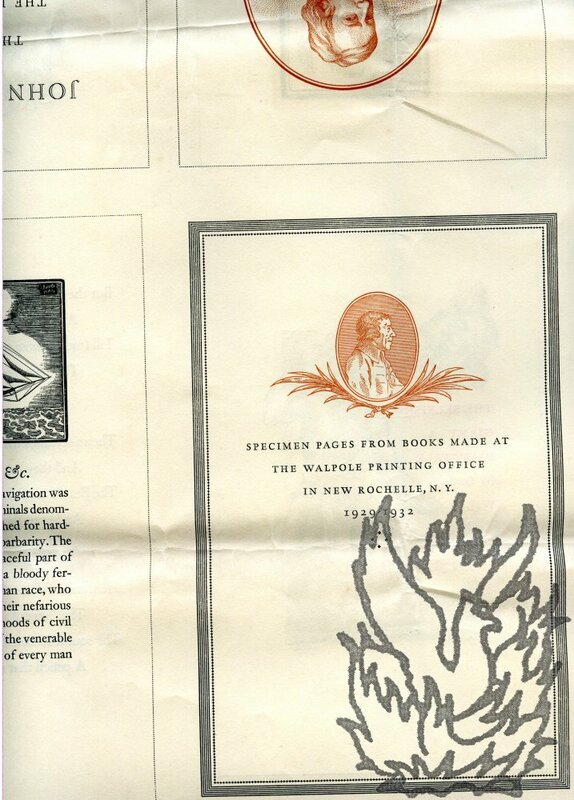 Recto: Title ('Specimen Pages from Books made at the Walpole Printing Office in New Rochelle, N.Y. 1929-1932') with vignette of Walpole. Specimen One, titled 'Piratical Barbarity, &c.', with illustration of pirate ship by Roth. Specimen Two, title-page of T. S. Eliot's 'John Dryden. The Poet. Autograph Note Signed ('John Oxenham') to 'Master M. Bull'. One page, 12mo. Very good, on lightly aged paper mounted on piece of card. 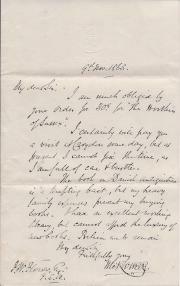 Reads 'London | July 28/13 | Master M. Bull | I append autograph as requested | Yours truly | John Oxenham'.